I really do enjoy cooking and I'm mostly in the kitchen either cooking tried & tested recipes or trying to create my own put together creations. 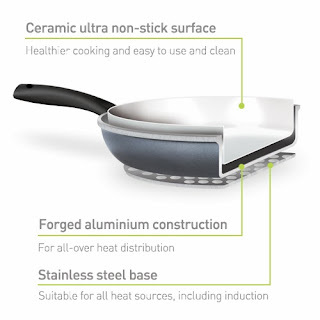 When I was offered the chance to review a non stick ceramic frying pan from JML Direct, I snapped up the chance quickly as I have always wanted a ceramic set of pans to complement my vast collection of pots & pans (all of them are non stick or aluminium based) so this was a much welcomed pan in my household. I thought I would try out my own made recipe of Paella to cook in my new pan, the recipe has been tweaked quite a lot because I do not like much sea food, except prawns of which I love (I will be adding the recipe soon). I was very pleased when a lovely 28cm ceramic Ceracraft frying pan arrived in a Cranberry & Black colour, just one of six colours and one of many sizes that are available in the range. Ceracraft Pans are made with a unique ceramic coating that has a PTFE free cooking surface to offer safe non- stick cooking. The ceramic surface is also scratch resistant, and is very easy to clean. The forged aluminium and stainless steel base is extremely hardwearing and durable, and the ergonomic easy-grip handle provides the best in safe usability. Ceracraft Pans are suitable for use on electric, glass-ceramic, gas, halogen and induction cookers. My first impressions of the pan was it looked very stylish and of a good quality, I decided that I would test this pans non stick capability with my Paella, which is a dish that always catches and sticks in my other pans. First of all, I added some sliced Chorizo which omits its own orangey paprika infused oil, so I did not have to add any additional oil what so ever, I then removed the chorizo from the pan and set aside. I added some chicken to the pan, that I marinated in some Cajun spices with a little chilli powder, I cooked this over a medium heat and half way through sprinkled some smoked paprika onto the chicken to add some more flavour. I then added sliced onions & mushrooms, cooked for a further five minutes before adding in some ready cooked rice that I brought from my local supermarket, you can add your own flavoured rice in if you wish, or in fact any cooked rice will do. By now with a normal pan, you would notice that the ingredients would start to stick, I did not have this problem with the ceracraft pan at all. I cooked the dish for a further few minutes to make sure the rice was piping hot, I then added my cooked chorizo and a handful of cooked prawns which I stirred & cooked for a further 2-3 minutes. That was it, my take on Paella was cooked and ready to serve, I divided the Paella between us and not once did anything stick to the frying pan during the cooking process, also the Paella just slipped from the pan onto the plates with ease meaning no scraping bits from the bottom which always seem to be burnt! Washing the pan was a breeze too as I had no residue at all on the pan except for a yellow colour from the Paella itself that washed off in one wipe, in fact the pan looked like it had never been used at all once it was washed and dried. I would defiantly recommend the Ceracraft pan range to everyone, the pan is the ultimate in non-stick cookware! no fat or oil required, allowing you to cook very healthily indeed and I'm so glad I have one of these pans myself, now to get me more creative in the kitchen. The Ceracraft range are available in six beautiful colours which are; Cherry Red, Lime Green, Lemon, Aubergine, Cranberry & Black and Chrome & Black, the range includes 20cm, 24cm and 28cm pans. Also included is the aroma lid for the 28cm pan. This clever lid drizzles aromas gradually on to your food to enhance the flavour. The Ceracraft pan range starts at just £19.99 and are available to purchase from JML Direct, Asda, Amazon, Argos, Wilko, Dunelm Miill, Sainsburys, Robert Dyas, Littlewoods and many more retailers.